LCS is under the Catholic Board of education of the diocese of Mangalore, A religious and linguistic minority institution which is a registered body .LCS is situated in about 2 acres of land on the Bijai Church Campus. Rev .Fr. J P Tauro who had taken over as the manager of LCS on 25th May 2003 .He has taken keen interest in the development of the school .Now the school has a facelift with an administrative block , well equipped laboratories for mathematics, physics , biology and chemistry and two computer suites, with one computer each to every students.The new Kindergarten and Lower Primary block with spacious canteen gives an additional look to the school . Hearty Welcome To Our New Manager ! Dr. Rev Victor J Machado Manager,LCS 2010…..
Lourdes Central School is endowed with an exuberant and dynamic personality in Dr. Rev. Victor J Machado as the new Manager from 4th June 2010. Dr. Rev Victor J Machado has innumerable achievements in the field of education to his credit. To place on record he has successfully accomplished Masters in Theology and Philosophy. He has obtained Doctorate in Philosophy from Rome, Italy. He shares his expertise in religious, educational and spiritual fields in the Diocese of Mangalore. His relentless and dedicated service as Professor and Formator at St Joseph’s Seminary for 21 years and as Rector for 6 years is praiseworthy. He has served in two parishes as Pastor for 10 years. He is a voracious reader and has a passion for teaching. As a prolific writer, he has edited the Seminary Journal and a book titled “Society and Church” and has contributed a number of articles to various journals. He is an ace speaker and a great thinker. He has presented Papers at National and International Conferences, Seminars and Symposia. Lourdes Central School is proud and honoured to have Dr. Rev Victor J Machado as the Manager. The school is headed by Ms Grace Noronha who has proven track record of more than two decades of experience in teaching, starting from kindergarten to college of education ,in and outside India. 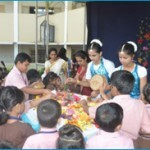 Ms Grace Noronha is ably assisted by experienced teachers with special skills and techniques of teaching in Kindergarten, Primary and Secondary classes. At LCS , emphasis is laid on the spirit of healthy competition , to go forward by striving hard for excellence, yearning for knowledge bereft of stress and strain , without resorting to unbridled competitiveness. LCS intends to maintain a high standard of education by ushering innovative ideas to make the system of education conducive to all-round development of the child , by doing away with unnecessary loads of books and materials , excessive home-work , dictation of notes, rote learning ,extra-tuition etc. Under the mantle of our patroness ,The Lady of Lourdes and the able guidance of Rev.Fr.Joseph Peter Tauro , Manager of our school, this growing school has a great promise for future. With the committed and tireless efforts of the Principal and the members of staff ,LCS will be able to reach greater heights and establish PEACE THROUGH KNOWLEDGE . Daniel Webster wrote that even as temples crumble and brasswork effaced, the act of working upon immortal minds will brighten all eternity. These were surely words that guided the eminent Educationist, the late Fr Bernard D’souza in the founding of numerous edifices to learning through the span of an illustrious career. As Parish Priest of St. Francis Xavier’s Church in Bijai, Mangalore, the vacant spaces of the Church campus beckoned with a call to be significantly transformed. Gradually the dream took shape for an ideal institution, a school with a difference, a peer to famous counterparts in big cities. The city of Mangalore is hailed as a beacon of progress in Karnataka State, and its achievements in Education constitute a dominant aspect of its fame. It is studded with academic institutions of the Scholastic, Collegiate and Professional variety. A good many schools, going back over a century, have enjoyed the trust and affection of the people for affording widely accessible education. Nevertheless, Fr Bernard perceived a lacuna in the near absence of nationally recognized curricula like the CBSE and ICSE in existing schools. Consequently, bright sparks were often under-stimulated and not able to rise to full potential in a wider arena of competition. Simultaneously, a quality school with a nationally standardized syllabus fulfilled a genuine need for children of parents in transferable jobs and returning expatriates. The academic challenge would necessarily be combined with focus on the values of discipline, diligence and integrity. A Pioneer’s vision thus encompassed the emergence of future leaders and administrators from sound intellectual and moral portals. The auspices of the Catholic Board of Education would validate this endeavor. It’s been a unique privilege for me to be part of this educational venture, handpicked by the Founder as First Principal of Lourdes Central School. Though I had three decades of work experience that stretched between Kindergarteners to B. Ed students and included an overseas stint, I was conscious of the magnitude of weighty new responsibilities. The Founder Manager’s seasoned wisdom would serve as a reassuring force in the invigorating mission of molding an institution. A thoughtful agenda and dynamic team of qualified personnel would thereby collectively strive to fulfill worthy aspirations. We were inspired by the ideal of leaving a lasting pedagogic impress on our tender young charges. 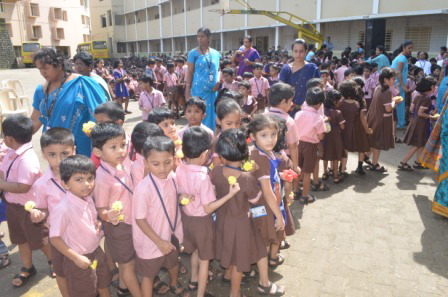 The fledgling school commenced existence on 2nd June 1999 with 230 students admitted to Kindergarten, Classes I &II. From these tentative beginnings in the Church Commercial Complex, it was housed the very next year in a campus of its own. The students could now optimize the learning experience amidst spacious classrooms and playing fields. As the onward march of school life commenced, so did the accompanying infrastructure of the libraries, laboratories, cafeteria, auditorium and so forth. The rapid renown of the school ensured a quick vertical and horizontal expansion. A new class was added every year with the forward progression of the first batch which is today in Class 12. Concurrently, the number of sections was increased to accommodate aspirations for a coveted seat in this prestigious institution. The school’s strength currently stands at 1350. This has been correspondingly accompanied with an expansion in the ranks of the school’s dedicated teaching and non- teaching personnel. Many of them have enriched the school right since its inception. I must make particular mention of the role of Mrs Joy Rai and her association with me in the growth of LCS, of which she is now Vice Principal. The teaching faculty adopt a personalized approach and innovative techniques for a child friendly mode of instruction. The location of the school in the serene and sylvan setting of Bijai Church makes LCS a beautiful learning space. The School emblem with images of an open book, a candle and a dove give symbolic expression of its ideal of “Peace through Knowledge.” The School Anthem was especially composed by the noted poet and pianist Dr. Madamme Louella Lobo Prabhu in a way that linked the shining vision of Mother Mary at Lourdes with the illumination derived from knowledge. The spirit of healthy competition is kept alive through the House System. Amber, Coral, Jade and Opal are jewels, and symbolically it is envisaged that every student shines in the multifarious display of talents that keeps the banner of the house flying high. The school calendar is brimful of interesting activities on nutrition, nature and the environment that tap the creative faculties of students. Experts and eminent persons frequently contribute their valued inputs to increasing the awareness of children in a multitude of different areas. The Inter- Class Poetry Recitation Contest every year introduces children to the finest poetry in the English language and the skills of synchronized expression. The Annual Science Exhibition appeals to the inventive talents of students. Festivals of all kinds are celebrated in a spirit of true fellowship. 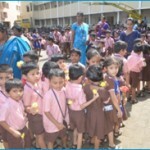 The School makes it a point to celebrate Independence Day every year in a manner that instills patriotism in students. 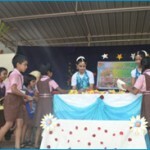 At Christmas time, the students are enthused to participate in different contests on the Christmas theme. The Sports Day of Lourdes School is a spectacular event of synchronized calisthenics and competitive athletics which takes place over two days at the City Stadium. The presence of parents at many of these events reinforces the cohesive bonds of the LCS family. “The Lute Player” and “Once Long Ago in Bethlehem” from the pen of Dr Louella Lobo Prabhu. The spectacular staging of “The World is my Oyster” – a global odyssey of dance, pageantry and melody evoked warm plaudits and offered a performing platform to over 600 children in February 2009. The school hosts competitive events like the General Knowledge Quiz to foster fraternity with CBSE and ICSE schools in Dakshina Kannada and Udupi districts. 2008 has seen the intellectual exercise of the Lourdes Olympiad in memory of the late Fr. Bernard. Social responsiveness is enhanced in older students through the recently started Outreach Program. Students of a neighboring school have immensely benefited in computer and communication skills through the “ Each One Teach One” concept of community service. Field trips and school excursions, to places near and far provide practical knowledge in the areas of history, geography, culture and civic values. The leadership spirit is inculcated the democratic way, in the functioning of a School Cabinet with duly allotted portfolios. The youthful energies of students are enjoyably vented in the playground with its basketball court, tennis court, handball and long jump courts. The school ardently believes in the power of communication. A Trimester Bulletin documents the term-wise activities and achievements of the school, often incorporating parental feedback on various events. The Annual Magazine has also emerged as a platform for the creative and communicative faculties of students and staff. The dynamic spirit of the founder Fr Bernard D’Souza has been duly carried forward by his able successor, Fr J.P.Tauro. In the course of his tenure requisite permissions were accorded to the school by the Govt of Karnataka. The affiliation of the school to the C.B.S.E. New Delhi was a major milestone in the functioning of the institution. The Parent Teacher Association also commenced existence in 2003, furnishing necessary synergies for the school’s progress through a host of participative Committees and fruitful activities. Growth mandates imperatives of spatial expansion and the improvement of facilities which have distinguished his ongoing tenure. The campus has acquired a loftier look with the modern infrastructure of a New Administrative Block. State of the art laboratories introduce children to the fascinating realms of computers, physical and natural sciences. A separate Kindergarten Block enables Pre-Schoolers and Juniors to maximize the early learning process with a conducive space of their own. The facility of a Cafetaria with its tasty and nutritious offerings is immensely popular with students. It was an ambitious dream to aspire for the International School Accreditation accorded by the British Council. But the right synergies inherent in the LCS talent pool ensured the successful completion of various challenging projects. The resultant British Council Award in 2008 has eventuated in fruitful educational exchange. Vice Principal Mrs Joy Rai and I visited the Pilton Blue Coat Church of England School, Devon of the United Kingdom in October 2008 which was immensely enriching. In February 2009, LCS reciprocated the academic and cultural interface with visiting foreign dignitaries Mr Paul Mulligan, Head Teacher, and Mr Ian Thomas, Co ordinator Global School Partnership of our twin school in the U.K. The international status of LCS represents a definite pinnacle of achievement. The first Batch of LCS did us proud with cent per cent results- 22 distinctions, 6 – I classes, and one II Class in the year 2008. The succeeding batch followed in the illustrious footsteps of their predecessors with a likewise cent per cent result – 50 distinctions, 19 – 1 classes and 6 – II Classes. Many students have totted up impressive individual scores. The toil of students and teachers has been rightly rewarded. One is confident that their successors will walk in these diligent footsteps to earn their own laurels. Upgradation to Senior Secondary Status (10 +2) accords LCS a further pioneering status in the educational landscape of Mangalore, offering students options in the Science and Commerce streams so as to be nationally competitive. Incredibly, LCS is in its Decennial year. Its achievements over the decade leave me proud and humbled at the same time. The abundant blessings of the Almighty, the graces of our patroness Our Lady of Lourdes, the sagacity of the Managers- (late) Fr Bernard D’souza and Fr. J.P. Tauro, the commitment of personnel, the goodwill of parents and the youthful zeal of students are all manifest in this eventful evolution. These conjoined energies have surely transformed a young institution into an eminent educational edifice that has reached commanding heights. Consequently, there’s a buoyant confidence of rising to ever greater challenges for growth in the years to come. Widely acknowledged in renown For imparting education. The history of commencement Lying in the recent past. Into a compact campus With its own distinctive brand. So wrote a parent, Giselle D. Mehta, in poetic eulogy of a school that has achieved commendable progress in a remarkably short span of time. Rev. Fr. Bernard D’Souza at Bijai Church Complex . Moved into our own new building on the Bijai Church campus. “Reading maketh a man”-New Library set up. Opening of the State of art Physics,Chemistry,Biology laboratories and Computer suite. Affiliated to the Central Board of Secondary Education, Delhi. 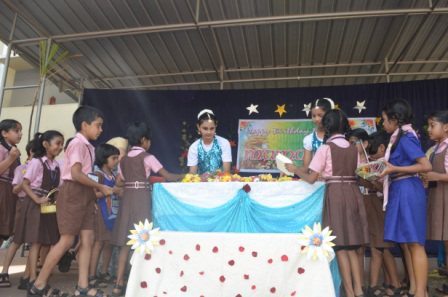 Spectra’-Celebrated Quinquennial of establishment of Lourdes Central School. New Administrative Block was inaugurated. Second computer suite was set up. Separate Kindergarten Block for Pre-schoolers and Junior block for Lower Primary Section was inaugurated. International School Accreditation [ISA] accorded by the British Council. Established a link with Global School Exchange Programme,twinning with Pilton Blue Coat Church of England Junior School, Devon – UK . The first batch of Class X achieved 100% results in AISE – 2008 –conducted by the CBSE – Delhi. Upgradation to Senior Secondary Status offering Science Stream. The second batch of Class X achieved 100% results in AISE–2009–Conducted by the CBSE – Delhi. Ushering in Decennial of Lourdes Central School. The third batch of Class X and first batch of Class 12 achieved 100% results in the AISE and AISSE - conducted by the CBSE-Delhi. Farewell ! A word that must be and hath been. A sound which makes us linger – Lord Byron. On 28th October 2011, the farewell programme for the outgoing Principal Ms. Grace Noronha was held at LCS in the Bejai Church Hall. The dignitaries present for the farewell programme were the Chief Guest of the day Ms. Philomena Lobo, Joint Director and Principal, College of Teacher Education, Mangalore; Guest of Honour Prof. Mathew Ninan, Principal, Little Rock Indian School, Bhramavar; President for the programme Rev Msgr. Denis Moras Prabhu; Rev Fr. Victor Machado, Manager, LCS; Mr. Ivan D’souza PTA President; Mr. Augustine Rodrigues, Vice President of Parish Pastoral Parishad, Bejai; and Fr.Ferdinand Gonsalves, Principal Designate LCS. 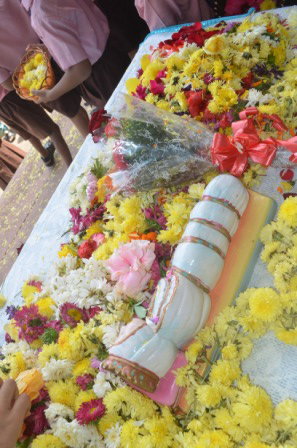 The programme began with a devotional ambience by the LCS students. Principal designate Fr.Ferdinand Gonsalves welcomed the gathering. The Chief Guest of the day Ms. Philomena Lobo highlighted on the qualities of the outgoing Principal Ms. Grace Noronha. In the address she termed Ms.Grace Noronha to have 5 C’s – Character , Commitment, Conviction, Courtesy and Courage. The Guest of Honour Prof. Mathew Ninan mentioned that MS. Grace Noronha is very graceful and gracious. He highlighted that LCS has shown remarkable progress because of the hardwork and dedication of the Principal. She is a Principal who is unperturbed , dynamic and innovative. Rev Fr. Victor Machado, Manager, LCS spoke on the occasion and said that Ms. Grace Noronha is a Pride of Womanhood in the society . The student representative Adith Jagadish delivered his words of respect in honour of the Principal. One looks back with appreciation to the brilliant teachers but with gratitude – Reem Zulekha, member of the Alumni Association,LCS delivered the words of appreciation towards the outgoing Prinicipal. The Principal Ms. Grace Noronha was felicitated on this occasion. The very Rev Msgr. Denis Moras Prabhu adorned Ms. Grace Noronha with a shawl, Ms. Philomena Lobo garlanded the Principal, Prof Mathew Ninan offered a tray of fruits and Rev Fr. Dr. Victor Machado presented the citation and a gift. Ms. Helen Serrao read the citation. The message from overseas sent to the Principal by the partner school Pilton Bluecoat, UK was read out by Rev Fr. Victor Machado. The student along with the members of the staff bid farewell to the outgoing Principal by singing a farewell song. The outgoing Principal addressed the gathering, thanked each and everyone for the success of the programme and showed gratitude in her words towards all the Lourdites for their hardwork and contribution to the programme. She appreciated the efforts of the Lourdites. 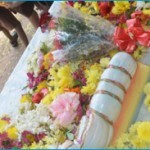 She bid goodbye to her long career in the realm of teaching and also payed tribute to Rev. Fr. Bernard D’souza. She guided the Lourdites to be honest, sincere, hardworking and to follow law through knowledge in the future years. The President Very Rev Msgr. Dennis Moras Prabhu addressed the gathering. On behalf of Catholic Board of Education, he wished the Principal a peaceful, happy retired life and the very best in her future endeavour. Ms. Shanthi Menezes proposed the vote of thanks. This was followed by cultural programme performed by the LCS staff and students. Siddarth Pai of Class 10 proposed the vote of thanks. The farewell programme ended with the National Anthem. With warmth and joy in our hearts and open arms we welcomed our dear Rev Fr Ferdinand Gonsalves as the head of the Lourdite family. Rev Fr Ferdinand Gonsalves with his experience and skill is a beneficial addition to our family. Even though the programme was short, it was one to remember.The poise and elegance of it was, similar to what Rev. Fr. Victor Machado said about the changing of guards. It was indeed beautiful. To make this event more memorable, our former Principal Ms Grace Noronha graced us with her presence, adding to the specialness of this occasion.And as she said the change of Principals ” is coming of the new and going of the old”. Well said, but this is not new or old, it is the handing over from a great leader to a progressive visionary. The inauguration ribbon was cut by Rev Fr Ferdinand Gonsalves, and began his new journey as the Principal of Lourdes Central School. As W T Purkiser has said, ” Not what we say about our blessings , but how we use them, is the true measure of our thanksgiving”. In a similar way, Rev. Fr. 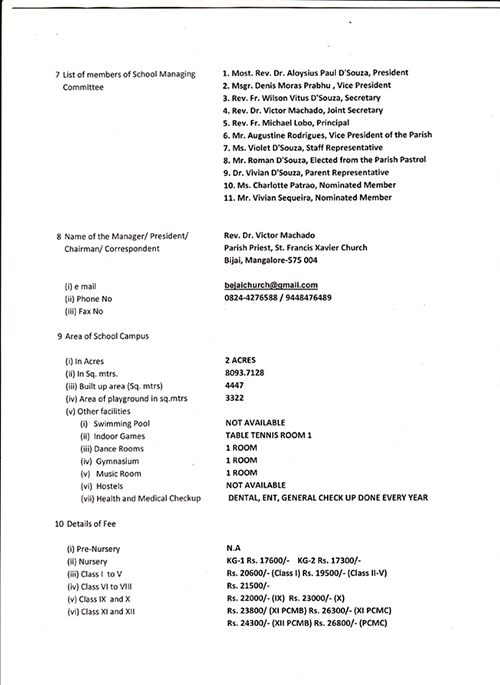 Dr Victor Machado blessed the Principal’s cabin, so that all of Rev. Fr Ferdinand Gonsalves future endeavours are fruitful and successful. Ms Sharmila Colaco being the MC for the occasion did an admirable job;her inspiring words gave the programme its suble flavour. All the PTA members, teachers and the management committee came together to make this event a successful one. On a sadder note, we bid our Principal of twelve years Ms Grace Noronha, a tear filled good bye. We wish her all the best for the future and she will be dearly missed. As we close one chapter of our school, we open a new one. Once again, we extend a warm hearty welcome to Rev. Fr. Ferdinand Gonsalves. All of us agree with the fact that all schools need to understand that learning is a unique process and every child will learn in his/her own pace. The responsibility of the school is to provide a conducive environment for a joyful journey in the process of learning. Lourdes Central School has been successful to a large extent to accomplish this task for the past 12 years. I appreciate very much and truly commend the sincere and honest work of the Founder late Rev. Fr. Bernard L D’Souza, Rev. Fr, Joseph Peter Tauro and Rev. Dr. Victor Machado and the first Principal Ms Grace Noronha as they tried their best to take LCS to this high standard. Now my only aim and sole purpose is to help our present students to analyse and evaluate their experiences. In the process of learning they need to be receptive and train their minds to question, investigate and think independently. I hope that the students at LCS with great pleasure will fulfill the above expectations. I believe that the teachers play a purposeful role in ensuring that the students stepping out of the portals of our school shine well, zealously pursue higher studies and occupy respectable better positions in the society and make our teachers and the nation feel proud. Swami Vivekananda had cautioned that “Education is not the amount of information that is put in the students’ brains to riot there and to remain undigested all through their lives! The effort should be on moulding of their character, inculcation of unflinching discipline and polite manners, development of knowledge, honing their skills and evasive talents and their all-round development.” Keeping these precepts of good education, teachers should commit themselves with a sense of fervour, perseverance and determination. My humble request to our teachers is to ponder these following words; A good teacher should love his/her students as if they hail from his/her family! All the teachers must know and agree that students want a living, caring, considerate and compassionate yet deeply erudite personality, possessing an excellent professional expertise as their teacher. My earnest desire and true ambition is to work tirelessly for LCS so that I may closely associate with it to bring a ray of hope in spreading PEACE THROUGH KNOWLEDGE by moulding students right from the beginning and inculcating in them the habit of peaceful co-existence. Living this bitter sweet moment and enunciating all good thoughts and feelings was Lourdes Central School on the 30TH MAY2013 at the Farewell programme organized by the manager and staff in honour of the outgoing Principal Rev Fr Ferdinand Gonsalves. The President for the programme was Rev Dr Victor Machado manager LCS; the other guests on the dais were Mr.Vaikunt Prabhu, PTEC President and Mr. Augustine Rodrigues, Vice-President, Parish Council, Bejai. The programme took off with a prayer song from the staff of LCS followed by a humble welcome from the MC, Mrs.Deepa D’souza. All the heartfelt feelings of the staff and of the persons closely associated with the school and the Principal were put in a nut shell in the citation prepared for Rev Fr Ferdinand Gonsalves.The citation was enunciated by Ms Vidhya Joseph. The Pricipal Rev Fr Ferdinand was honoured with a shawl,gift and citation by the Manager Rev Dr Victor Machdo. 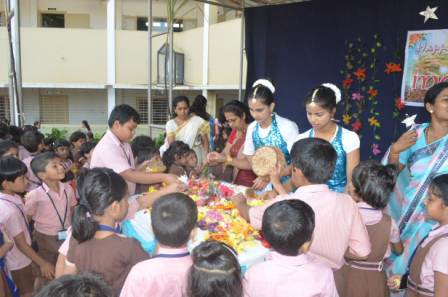 Ms Roshni Jose and Mr Rohan Sequeria offered fruits and flowers as a token of love and gratitude. The President in his address congratulated the Principal for the good results that the school has secured under his leadership .He wished well and acknowledged his cheerful presence in the school that kept things going smoothly. Mr Vaikunt Prabhu, President of the PTEC expressed his gratitude to the Principal and also congratulated him for taking the school to greater heights. Reciprocating the feelings of the staff and the invitees the Principal expressed his heartfelt thanks to the Manager,Staff,Managing committee and Parents for all the support . The programme concluded with the vote of thanks from the MC, followed by a sumptuous luncheon. This auspicious occasion formally commenced with the lighting of the lamp which banishes darkness and leads to the path of wisdom, followed by short introduction of the new Principal by Fr Manager. Flowers always bring joy and happiness. The same was expressed by Fr Manager, Staff and Student Representatives with a floral welcome. On behalf of the Staff and students Mr Ivan Mascarenhas and Head Boy Sanjan Prakash had the privilege to welcome the new Principal. The new Principal Fr Michael Lobo’s maiden speech to the LCS Family brought a ray of hope on every Lourdite. The programme continued as the new Principal cut the inaugural ribbon and made a solemn entry into his cabin while Fr Manager prayed for the success and the mission entrusted to Fr Michael Lobo. The school choir presented a melodious prayer song, welcome song and concluded the programme by singing “ On this school your blessings Lord”. Students had a sweet smile on receiving sweets on the occasion of the arrival of the new Principal. After the school hours, the teaching and the non –teaching staff of LCS had a friendly interaction over a mouth savouring refreshment. Three cheers to the Organising Committee for making this day memorable. 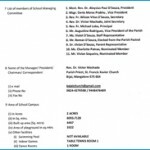 Lourdes Central School is endowed with an exuberant and dynamic personality in Dr. Rev. Victor J Machado as the new manager from 4th June 2010. Dr. Rev Victor J Machado has innumerable achievements in the field of education to his credit. To place on record- he has successfully accomplished Masters in Theology and Doctorate (PhD) in Philosophy in Rome,Italy.He shares his expertise-both in educational and spiritual fields. As Professor, formator and Rector of the Seminary, he has served relentlessly at St Joseph’s Seminary for a long period of 27 years. He has a passion for teaching. He is an ace speaker and a great thinker. As a prolific writer- contributed a number of articles, journals and authored a book on Society and Church. He presented many papers at Conferences, Seminars, Symposia etc. It is indeed an honour to have such a learned and magnanimous personality as Manager of Lourdes Central School.